Wasp-mimic Robber Fly II - Chrysopogon sp. This page contains pictures and information about Wasp-mimic Robber Flies that we found in the Brisbane area, Queensland, Australia. This is a small robber fly mimicking Vespoid Wasp. 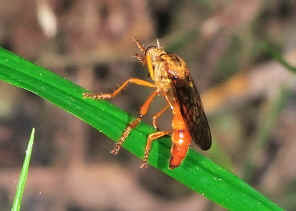 It is orange-brown in colour with minor black marks on thorax and abdomen. All legs are orange-yellow in colour. Wings are tinted with dark colour with black veins. 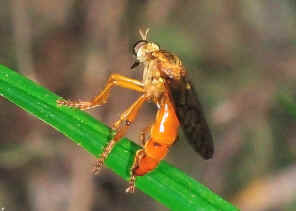 This Robber Fly is bright orange in colour. We found it in Ford Road Conservation Area on Feb 2011. The fly was flying in short distance between low plants hunting for prey. 1. Insects of Australia and New Zealand - R. J. Tillyard, Angus & Robertson, Ltd, Sydney, 1926, p362. 2. 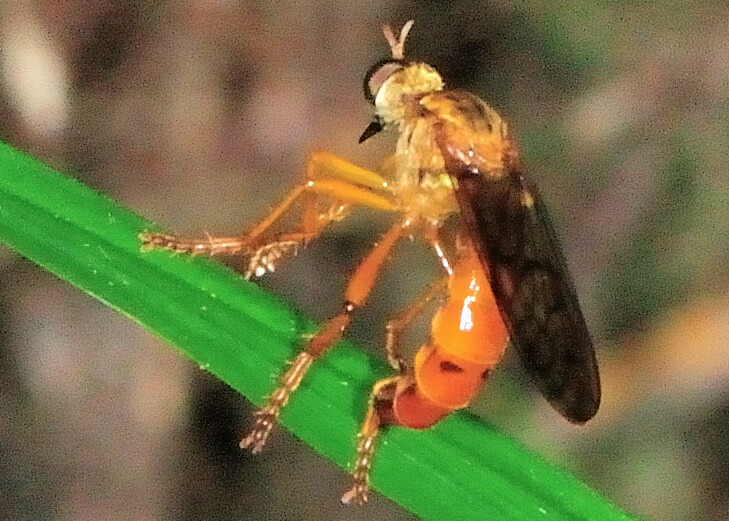 A Taxonomic Revision of the Tribe Chrysopogonini (Diptera : Asilidae) - A. N. Clements, Australian Journal of Zoology Supplementary Series No. 109, CSIRO 1985.